The Carina Nebula. Credit: 2.2 m ESO/MPG telescope, La Silla Observatory, Chile. The Carina Nebula can’t be seen. Natural eyesight, unaided by technological enhancements such as telescopes, doesn’t respond to the meager glow. Telescopes narrow our natural vision, magnify the glow, and respond to “extrasensory” wavelengths. We shape the instrumental responses into simulacra of natural responses and make sense of them in relation to prior experiences, presumptions, and theories. Most astronomers presently make sense of the Carina Nebula according to gravity and meteorology: They see a cosmic perfect storm. It is a region of short-lived giant stars, stellar explosions, fast winds, shock waves, and mechanically twisted lines of frozen magnetic force. The friction of the gravitationally driven turbulence generates radiation from radio waves to x-rays. Electric Universe proponents make sense of it through plasma phenomena: They see a catastrophic short-circuit in the galactic power grid. Entangled Birkeland currents interrupt the interstellar power flows, and the inductive energy of the “transmission lines” flows into the break. The filaments of current jump into glow mode and provide a backlight of aurora-like curtains. Foreground filaments still in dark mode reveal their spiral and braided structures (for example, the dark DNA-like structure to the right of Eta Carinae, the brightest star in the lower left). Magnetic fields generated by these currents pull in and concentrate surrounding plasma, pinching bits into new stars—the cosmic counterpart of ball lightning. Clusters and lines of stars appear throughout the nebula. Primary currents induce hierarchies of subsidiary “leakage” sparks, filling light-year size regions with parallel filaments of “coronal hair.” (Examples are in the dark nebulosity at bottom center and in the glowing fans at upper left center between the two yellow stars.) Tubular discharges—interstellar electrical tornadoes—twist through the chaos (at upper left, for example). Instabilities evolve through petroglyph-like forms, such as the seven-rung “ladder” in the dark filament to the right of Eta Carinae. The sudden burst of energy along these currents feeds supernova-size exploding double layers (the bubble-like forms scattered around the region). These and other double layers accelerate electrons and ions to relativistic velocities. The electrons spiral in the magnetic fields and emit high-energy synchrotron radiation. Slower electrons emit radio waves. The high-energy ions escape as cosmic rays. The making of sense leads to new responses, which eventually require new sense to be made. Therefore, science is ever provisional. 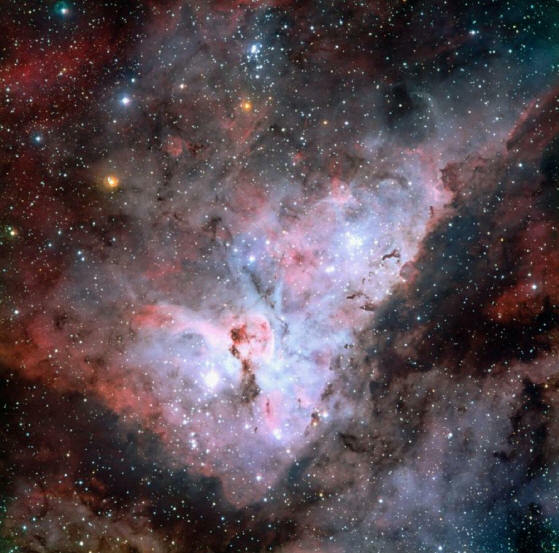 Any proper scientific understanding of the Carina Nebula will keep in mind the question: How much of it still can’t be seen?